In a surprise move today, Toyota held a press conference (see video below) announcing a substantial investment in robotics and AI research to develop “advanced driving support” technology, with former Program Manager of DARPA’s DRC Gill Pratt directing the overall project as Executive Technical Advisor. 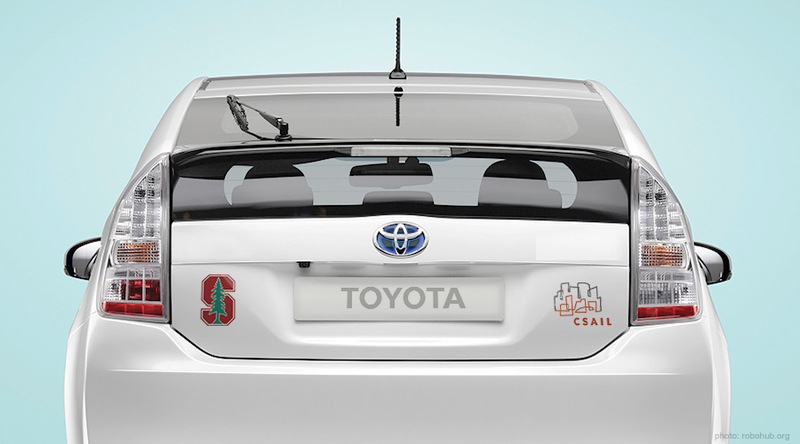 Toyota will allocate USD$50M over the next five years in a partnership with MIT’s CSAIL (headed by Daniela Rus) and Stanford’s SAIL (headed by Fei-Fei Li) to develop research facilities in Stanford and Cambridge. First, Toyota doesn’t refer to autonomous cars but to ‘advanced driving support’ . And this makes sense because, unlike Google (with its fully autonomous car), Toyota’s origins are in car manufacturing and not in software development. Car manufacturers have for some time been introducing ever rising levels of autonomy in their cars and Toyota is following that vector. There are legal advantages to having the driving be ultimately responsible for the car’s movements and therefor any possible accidents; when a vehicle doesn’t respond as expected, a costly product liability suit could follow, as Toyota well knows. Thus what appears at one level to be a more conservative approach to autonomy on the road may in essence be a way to bypass potential legal nightmares and bring autonomous driving technology to the market sooner. Kiyotaka Ise, Toyota Motor Corporation Senior Managing Officer, repeatedly stated hybrid cars as an example of a specific technology that Toyota pioneered (along with Honda) and brought to market even while it was borderline unprofitable due to its large cost at the time. This offers a possible hint of what may follow. The second interesting point made clear during Toyota’s Q&A is that this project is only part of the auto manufacturer’s investment in the field. $50M is a lot of money, but for a profitable car maker the size of Toyota, it isn’t much. It looks like Toyota wants to establish a strong presence in the US by collaborating with two of the best research centers in the world (the budget will be equally split between the two universities) but being a truly global company, it is developing other projects elsewhere as well. It’s worth mentioning that almost all large car manufacturers have similar research projects, and they usually collaborate with research institutes, universities or with each other. In this respect, Toyota’s decision to bring on Pratt as the project lead appears astute. Pratt’s high visibility role as Program Manager of DARPA’s DRC has left him with significant experience managing and promoting large, big-budget projects, and has provided him with deep connections into US research labs.